Doesn’t it seem like these days that there are 100+ different cleaning product available for just the bathroom? Not only that, but products for our drains, floors, toilets, counters, and glass…basically there are countless commercial cleaning products for just about anything you can think of. My journey into homemade cleaners began when I would read labels that said CAUTION, POISON, DANGER, or WARNING. Thank goodness there are simple and safe products that can be made for use in most cleaning situations that will dramatically lessen my family’s exposure to toxins and chemicals. For example, castile soap, vinegar, and baking soda can work wonders with even the toughest grime that may be lurking in my bathrooms. Plus, there’s always the added benefit of saving money when making your own simple and quick homemade recipes, as well as knowing your creative efforts are free from toxins for you, your family, and the environment. *Buy in bulk and save! I get my baking soda, essential oils, and castile soap from Mountain Rose Herbs. Directions: Add liquid castile soap to baking soda slowly until paste is formed. Then proceed to add antiseptic essential oils. Apply scrub to sponge for use on surface to be cleaned. Directions: Combine baking soda and essential oils in a mixing bowl. When ready to clean toilet bowl add vinegar and pour mixture into the toilet. Then scrub with toilet brush. Note: This is a single use recipe. There is no method of storage due to the fizzing action. 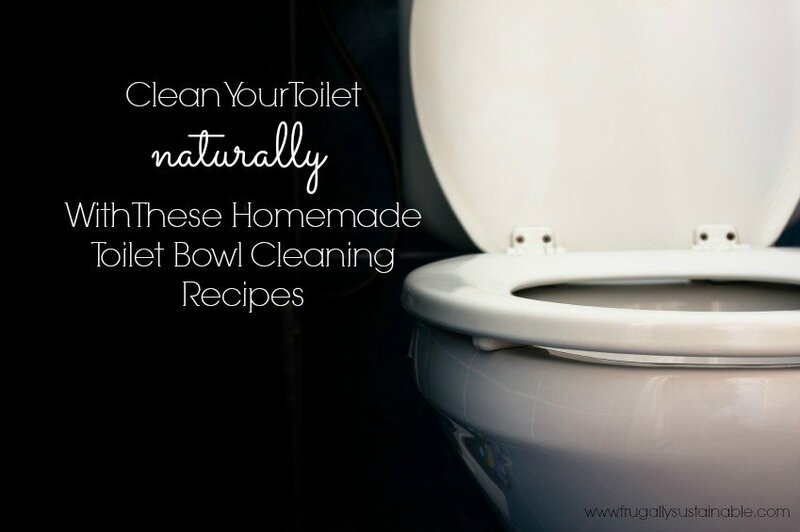 Often times the “Toilet Bowl Cleaner” recipe is enough to clean the stains in my toilets. However, there is the occasional instance when I’ve gone too long in between cleanings and tougher stains require the use of the “Homemade Soft Scrub” in addition to the toilet bowl cleaner. –Mountain Rose Herbs…they have everything you’ll need for these recipes! It’s your one-stop-shop! click here to get your copy of my ebook Simply Clean today! 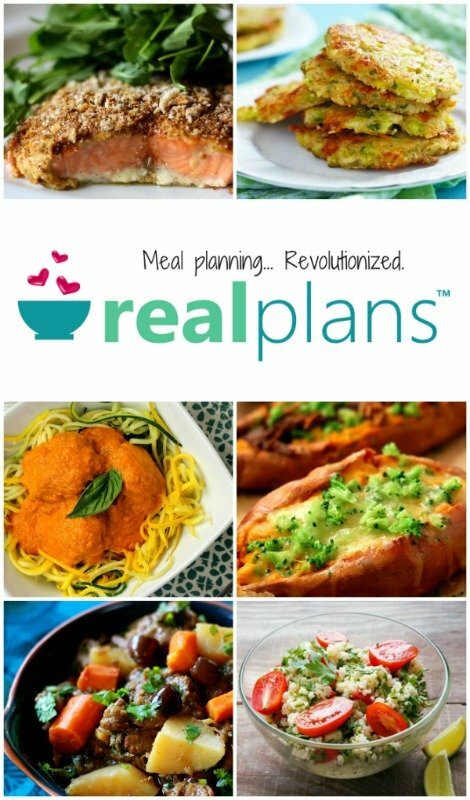 I mihgt have to try these recipes! That is a mighty clean toilet you have there! Thanks for sharing. My sister claims the easiest way to clean a badly stained toilet is with pumice. And it doesnt scratch!!! I agree too – my hubby used it a couple of days ago on REALLY old and bad hard water stains – completely gone!!! I use only baking soda and vinegar for most of my cleaning…and a pumice stone works as well. But because I clean the toilets every few days, nothing has time to sit and harden. Great post….enjoy reading your blog. I have a septic system so I try to be careful about what I put down the drain. I've been using just the baking soda and white vinegar combination (just sprinkling baking soda and then pouring in the vinegar over it) and it works really well. I have well water also, so I get the hard ring pretty quick. The pumice works great for that. Is this ok to use on a septic system? 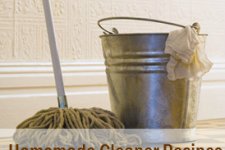 I have switched all my cleaners to homemade cleaners with the exception of toilet cleaner. Thanks for linking up to the Frugal Tuesday Tip. We always get such wonderful ideas. If you are using these ingredients in your cleaning already then they are already going into your septic tank. All drains in your house should be connected to the septic. These ingredients though shouldn’t be an issue in the amounts we are talking though. The way a septic system works (incase you don’t know) it so provide a bacterial environment that breaks down the waste. Any anti-microbial ingredient (natural or otherwise) can cause a problem for a septic tank by killing off that bacterial environment. But, again, the amounts we are talking shouldn’t be an issue. One thing to consider would be ways to minimize the amount going down the drain. One way to do that would be to find ways to reuse the solutions such as make a solution of vinegar, water and essential oils in a bucket. Use this solution to clean the counters, doors, walls… when done with that use the remaining solution to clean the floors and finish with a clear water rinse if you need. Another way is to dump the solutions outside. HOWEVER!!! before doing this make sure you check your local “grey water” laws. If it is acceptable in your area to dump grey water of this nature outside make sure to chose a different spot each time so as to not build up a concentration that could be harmful to the plants in the area. I hope this helps!!! I love cleaning with baking soda and vinegar. Thanks for the recipes! I've used just plain white vinegar to clean toilets. It works awesome in hard water areas because the acidity of the vinegar dissolves hard water deposits. I empty the water from the bowl first as much as I can so that the vinegar is more concentrated. I've never tried it with the baking soda added, but will give it a shot–it may be MORE awesome! http://www.facebook.com/pages/Momma-Hen/123880607653210 I shared this on my FB page! We got a new toilet last year, and already the underside of the seat is very discolored and has some odor. Do you know what will get it clean and white again? I have tried that soft scrub but without tea tree oil…I'll have to try it with! Hydrogen peroxide works well for removing the stains that may remain after cleaning properly with recipes such as the ones above. It is the only thing that I would include in my list of natural cleaning ingredients that isn’t included in the articles list. @'Becca Try the baking soda/vinegar recipe. And try spraying some vinegar under there. Vinegar should clean it…sounds like hard water issues. I make the same soft scrub recipe. I have scented castile soap, so I leave out the essential oil. It works so well, I always wonder how the toxic stuff continues to sell! Great to know! 🙂 I’m just getting started in homemade cleaning recipes. We have very hard water and I’ve been wondering about just this very thing. Thanks! Thanks for the toilet scrub recipe! I have a green house cleaning business and all my products are homemade and they work better than the store bought – I use vinegar and baking soda for cleaning toilets – it is the first thing that I do when starting to clean a bathroom – I let it sit while I am cleaning the rest of the bathroom and at the end I scrub the toilet, it works wonders – for tough stains I use a pumice stone – incredible. Great blog. Where do you find the ingredients? I live in Indy which is not a small town but I never see these ingredients in the grocery stores. Do I have to order it all off of the net? Any advice? You can find castile soap at target now, near the makeup section where they have the more expensive/natural brands of face wash etc. whole Foods on 86th street (about a mile east of Meridian, in Nora) has all the essential oils. Borax and washing soda at Meijer usually, but I would imagine theyre available at whole foods too. I just stumbled upon your blog and I think I am going to love it. Signed up to get your emails. I love the recipes you give for cleaning. Thanks. Do you just sprinkle the soda in the water or on the sides where (my) stains are?! and then pour the vinegar directly over the stains or just into toilet. My toilets look awful and I don't know what to do so I really want to try this!!!!! Do you make up any of the cleaning solutions in advance? For instance, could you have the baking soda/essential oils already mixed and store them that way, just adding mixing in a small bowl with vinegar when it's time to clean? Just wondering as I'd like to not have to measure everything out each time I need to clean. So glad I came across this! We use Melaleuca products (which I love, they don't smell and NO safety caps – cause they are safe), but they don't have an actual toilet bowl cleaner – so I have still been using the stinky store bought stuff. Now whenever I use it all that is going through my head is "POISON!!!!" Will be trying this as soon as this sickness is over! I like to put a few drops of grapefruit seed extract (GSE) into the toilet when I'm adding the essential oils and I love to use grapefruit essential oil… it smells SO fresh and is my happy scent! One thing that really helps, no matter what cleaning solution you choose is those magic eraser cleaners… seriously, even in the toilet. My kids discovered that and looked at me like "really Mom?" when I asked "it really works in the toilet too?" so I tried it and yep, they were right again. It actually got the mineral deposits in my toilet to pull away from the bowl in big shards… careful, they're sharp! I started using water,vinegar,a dash or 2 of dawn dish soap in spray bottles for all my cleaning needs. It works great, it's easy on the pocketbook and is not chemically dangerous.everything sparkles and smells great. You’ll love the soft scrub! So please clear this up, pumice as in the same stone I use to scrub my feet??? It will not scratch the toilet? I can’t answer that Grace:) I’ve read about using a pumice stone but I’ve never tried it myself…anyone else have info on this? It will not scratch the toilet at all. I have been using it for years with no problems and my mom has as well. You can buy it on a stick so that you have a handle to hold onto and to use all sides of the stone. I’ve only found it online or in catalogs. I can’t find it in any of our regular stores. Sometimes it starts to break at the handle if you really bear down on it, but if you keep up with the cleaning, that shouldn’t be an issue. I’ve used a pumice stone for years and it works great on those hard water rings with no scratching. I found mine at Lowes in the cleaning isle. I love that stuff too! So simple and cheap:) And you’re right, it works on a multitude of surfaces. I am really big on disinfecting…is that what the tea tree oil does? Tea Tree Oil is one of the most wonderful essential oils for disinfecting! I come from Australia where it is abundant, & it is antiseptic, antifungal & antiviral… I use it, diluted, in many skin preparations & it is wonderful for acne… but I digress! It is better than most of the disinfectant preparations you buy in the cleaning aisle… Lavender is also awesome, & I use it for everything from zapping zits, to adding a few drops to my laundry to really kill the bacteria that cause body odour smells… works wonders on shirts that never seem to get fully fresh under the arms! I also carry it in my first aid kit as it’s gentle to skin & kills so many germs! Great diluted for sunburn, too! For the soft scrub, can lavender essential oil be substituted for the lemon? I have lavender on hand. To everyone using vinegar and banking soda. An absolutely awesome polish, cleaner is Vinegar and oranges. I juice my oranges so I take the outside rinds and you put them in a pitcher or container of white vinegar. Cover solution for 2-4 weeks. I usually wait about 10 days. Strain the liquid and you have perfection. Keep in mind many cleaners have toxins but have orange oil in them. The peels release the oil. I clean my granite and it has never looked so polished. I clean all my cabinets, it polishes stainless steel perfectly as well as stoves. Plus it has a nice orangey smell. Thanks for the above info as well. do you have any recommendations on how to keep your toothbrush clean? any recommendations on how to keep your toothbrush clean? we place them in boiling water every month or so. Dont store them wet in a medicine cabinet either (mold). You could also soak them in rubbing alcohol to kill any “ickys”. We also replace them a lot, so inexpensive at the dollar stores. I buy toothbrushes for just about any occasion calling for gifts (family only though). My daughter has grown up over the 20 years expecting a toothbrush in her Christmas stockings, Easter baskets, etc. I forgot one year for her birthday and she was not happy!! she is 27 now and still gets toothbrushes. Do you have a recipe for homemade dish soap? just a note on the anti-septic stuff. If you are on a septic, you must watch the “anti-septic” things you flush. you need the active bacteria to break down the body waste in the tank. Same goes with anti-bacteria cleaners and such. As always, flush nothing but toilet paper and body wastes. No wipes, condoms, bleaches, foods, sanitary products such as tampons, etc. I work for a septic company and trust me, just toilet paper and body wastes. Stay away from the septic additives you can buy from the store, too. Waste of money. If they worked, we would sell them. Is Castille soap easy to find? I haven’t seen it. Is castille soap easy to find? Another satisfied housewife! I started this “make your own cleaners” journey about 6 months ago with a very skeptical husband. We started with laundry soap and he just admitted today that he thought it worked pretty well. Today when I announced I was going to walmart to buy things to make other cleaners he once again was a little reserved but when he gets home I think he will be pleased. Today I made and used: both items listed on this post, window cleaner, mirror cleaner, dish soap, and all purpose cleaner. I also found a recipe on another site for floor cleaner that was very similar to your all purpose cleaner and use that too. MMmmmmm the house smells great! Thanks for the time and energy you put into this blog. It’s amazing! Oh and by the way, I shared your blog on Facebook! I also use citrus infused vinegar. It works really well. I use it with my homemade laundry soap when i wash my colors. what about underneath the toilet rim? 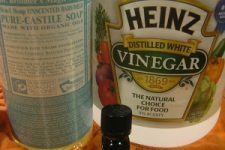 I found an amazing bathroom cleaner through a friend (and Pinterest) that is mostly vinegar with a bit of Dawn dish soap. Today was one of those times when MY toilet had gone a bit longer between cleanings than it should have and as I sprayed my mixture the stains were literally disappearing before my eyes!! What would be the natural (and equally effective) alternative for Dawn? I saw your liquid dish soap recipe, and was curious if this would react in the same way with the vinegar. Thanks! Have tried everything to remove rust stains in toilets, showers, sinks, washer tub and clothining in wash but no luck. We have well water and septic tank. Help, please ???????? 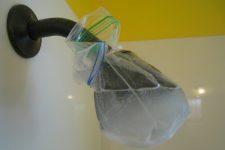 Do you know of a good homemade recipe for removing mold from tiles in the shower? I do not want to use bleach – too toxic! Love these recipes by the way – and all the great comments! Could you recommend an alternative to the tea tree oil? My family has an aversion to anything containing it. What about rust stains and hard water line? Even with softener we have these problems. I have just started do these homemade recipes. I need to know where to find castille soap. I have looked in Walmart and asking anyone in there for it is like pulling teeth. What dept. would it be in if Walmart sells it? Thanks for all the great info, I never knew how well vinegar cleaned everything, thought it was just good for windows and coffee pots,LOL . 2nd Question, as for the toilet cleaner and soft scrub; can you use the washing baking soda or just plan baking soda? Hi Cindy, you posted this a while ago so I hope you found it! I have never seen castille soap at Walmart. Our local health food store carries it. Amazon also carries Bronner’s castille soap, which seems to be the most popular brand. Make sure to check the ingredients, because one castille soap on Amazon I considered had synthetic chemicals (don’t remember which brand, but it wasn’t Bronners). You can remove the water , or most of it, from the bottom of the bowl by simply using the toilet bowl brush….just keep ramming it down the drain (not violently!) and the water will leave. This gives you a less diluted vinegar and soda mixture and you can get at that water line easier. .. a plunger works as well but, hey, the brush is already there! I love your cleaning ideas. Want to receive your blog. nothing I have made has worked so far. Any one have any ideas what I could try. It MIGHT have been helpful if it had been mentioned that the material, before putting in the molds, would NOT hold together, but be in a powder-y form. I thought I had done something wrong, because the ‘final product’ was still just a powder, so I decided to use it by taking a tablespoons and putting it in the toilet: Well, this morning I tried it, but the entire thing had hardened in the container!!! Now I have a huge solid rock of the material, with no way to even measure it out and use. AAARRRRGGGGG!!! I should mention that this is in reference to the DIY Toilet Bombs….. Please send me your new posts.